The Sultan Omar Ali Saifuddien Mosque. See Brunei#Get in for Brunei's entry requirements. 4.94359114.9283651 Brunei International Airport (BWN IATA) is the main airport in Brunei. See Brunei#By plane for airline details. A taxi from the airport to the city centre takes 20 minutes and costs around B$25. Some hotels may provide transport between airport and hotel for free or for a cheaper price. A covered walk down to the end of the car park away from the Terminal (turn left when exiting from Arrivals) leads to a bus stop for Purple buses to the city centre during the day (B$2). All main roads in Brunei (save for those in isolated Temburong Districts) lead to Bandar Seri Begawan. The main road into/out of Bandar Seri Begawan connects to the coastal road to/from the Sarawak border via Tutong, Seria and Kuala Belait. Other main roads lead to Muara and Kuala Lurah where there is a border crossing into the Limbang division of Sarawak. Take this road if you are driving to Temburong but you will have to go through two sets of immigration checkpoints - at Kuala Lurah (Tedungan on the Sarawak side) and Puni (Pandaruan on the Sarawak side) - before you reach the district administrative center, Bangar. 4.88786114.94372 The main bus terminal where most local and long-distance buses leave from and arrive is at Jalan Cator in the city centre. It occupies the ground level of a multistory carpark. Map of Brunei public bus routes. From Seria: Regular buses leave for Seria (where you can change buses to Kuala Belait) that leave from the main bus terminal. They usually display the departure time on the windscreen. Journey time is about one hour and the fare is B$6 one way. Going the other way, there are buses from Kuala Belait to Seria (B$1) where you can change to another bus for Bandar Seri Begawan (B$6). From Kuala Lurah: Local minibuses run from the bus terminal right up to the Kuala Lurah checkpoint throughout the day. Journey is about half hour and fare is B$1 one way. At Kuala Lurah, walk across the border and either catch a bus or taxi into Limbang. From Miri: Buses leave twice a day at 8:15 and 3:45 from Miri bus terminal and arrive at the waterfront near the main bus terminal. RM50 or B$22; RM35 or B$17 for children 3–10 (2019). From Kota Kinabalu: There is one bus per day, arriving and departing at the waterfront near the main bus terminal. The bus to KK leaves at 8AM, but get there at 7:30 to buy the ticket. It takes 6–8 hours and costs $45 (2019). View from above Bandar Seri Begawan. The main ferry terminal in Brunei is the 5.013836115.0654263 Serasa Ferry Terminal at Muara. The ferry terminal has currency exchange, a small souvenir shop, and a cafe. There are about five daily ferries to Labuan (the first one departs at 8:30AM, while the last at 4:30PM), journey lasts from 45 minutes to two hours depending on the boat. It's best to arrive an hour early to buy tickets; boarding starts half an hour before departure. The ferry costs B$15 + terminal tax B$2 (2019). With a change of boats in Labuan you can even make it to Kota Kinabalu (Sabah) in a day (see Kota Kinabalu to Brunei by land). The same applies to Lawas and Sundar (both in Sarawak) accessing which requires changing boats in Labuan. Serasa terminal is 25 km from Bandar Seri Begawan and also in quite a distance from Muara town. Getting there: The ferry terminal is quite a distance from Muara town where the container port is. The terminal is about 25 km from Bandar Seri Begawan. Buses to Muara depart from the Bandar Seri Begawan bus terminal in Jalan Cator, first bus departs at 6:30AM. There are two possible options: the first is to catch a shuttle express bus that goes directly to the ferry terminal and costs B$2, departs roughly every 2 hours. The second option is a regular bus #37, #38, or #39 to Pekan Muara (the end of the line), where you can transfer to #33 that will go to Serasa Ferry Terminal, price is B$1 including transfer. Altogether, it can take as much as two hours to get from the bus terminal to the ferry terminal. Or you can just take a tour van or taxi. From Bangar. Speedboats leave for Bangar in Temburong District from the jetty near the foodstalls at Jalan Residency just over the bridge across Sungai Kianggeh to the east of the city centre. Regular boats run between Bandar and Bangar throughout the day. 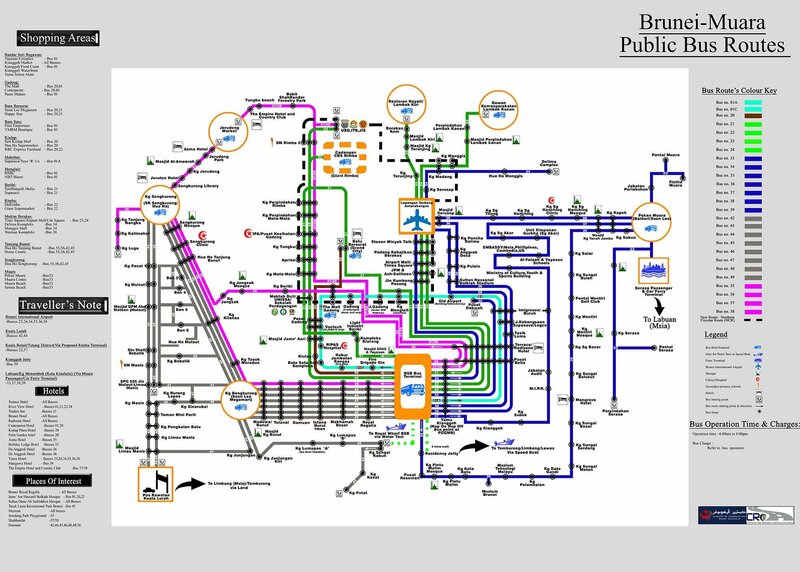 Try to pick up the official map of Brunei Darussalam, as it is easy to read and the public bus lines are easy to follow. The people of Brunei are very helpful to visitors, so don't be surprised after a few minutes of conversation they offer a ride to one of the attractions, as they know how much easier it is to drive there than get there any other way. Downtown is quite small and can be easily navigated on foot. At several intersections there are walking maps of the Heritage Trail which includes the Omar Ali Saifuddien Mosque, Tamu Kianggeh (Kianggeh Market), and the Royal Regalia Museum. Public minibuses are the cheapest way to travel in the city. They start service at 6AM but end quite early (at about 6PM). They run roughly every 20–40 minutes from 6AM to 6PM, but there's no strict schedule. Most of the bus routes begin and end service at the bus terminal on Jalan Cator downtown. Routes are numbered and the buses are different colors depending on the route. They cost B$1 regardless of distance (B$0.50 for children); the fare is normally collected by a conductor but may also be collected by the driver. They have designated stops but also stop anywhere along the route to drop or pick up passengers (so if you want to stop, just indicate it to the conductor on the bus, and the same thing if you want to get on). The buses are actually more like large vans which can seat about 20 people at the most, and are generally clean and comfortable to ride. Main bus routes include bus service 01 (Circle Line) and 20 (Business Centres Line). The detailed routes of the bus services are written on a board placed on the front window of the buses and are also drawn on the information board at the Jalan Cator terminal. Try asking the counter tickets for a tour van to drive you around Brunei and bring you to the places. Discuss the price first before you agree to board the van. It's almost impossible to hail a taxi outside of airport, so it's better to arrange a one via hotel or call a taxi service. Taxi services: ☎ +673 2222214, +673 2226853. Airport Taxi Service: ☎ +673 2343671. The main ride-hailing app in Brunei is Dart. You can hail a few water taxis at almost any dock but the most popular place to find one is on the waterfront downtown. They are great fun to ride in, and they're also a useful way to get to the Water Village and to some of the city's outlying neighbourhoods. Drivers also give tours to see proboscis monkeys and the Water Village; see below for details. Downtown BSB is small and easy to get around on foot. There are more sidewalks than in cities in neighboring Sarawak. Be careful of the pedestrian traffic lights – most of them stay red and don't change even if you press the button, so instead time your crossing by paying attention to the traffic lights for cars. Drivers in Bandar are fairly polite to pedestrians – they usually wait when they see pedestrians in the crosswalk, especially downtown. Don't expect to find much tasteful and stunning architecture like you would normally find in Southeast Asia. Here, most of the buildings are just plain and box-shaped. However, an interesting twist to the billboards around here, is that the "Jawi" (Arabicized Malay writing) are prevalent among them. Sometimes, foreign names are translated literally, e.g. "Pizza Hut" to "Pondok Pizza". 4.889578114.9391361 Omar Ali Saifuddien Mosque, Jalan Elizabeth II. Sa–Th 8:30AM–noon, 1:30PM–3PM, 4:30PM–5:30PM; F 4:30PM–5:30PM. Open to visitors when it is not being used for prayers (opening times are posted by the gate). The mosque is very welcoming and if your clothes aren't considered appropriate you'll be given a robe upon entry. Remove your shoes before entering and be respectfully quiet inside as there may be some people there meditating and praying. The mosque is visible from around the centre of the city, but the entrance is located on Jalan McArthur, just south of Jalan Elizabeth Dua. Free entry. 4.897944114.9217782 Jame'Asr Hassanal Bolkiah Mosque, Jalan Stadium Negara Hassanal Bolkiah, ☎ +673 223 8741. M-W Sa 08:00–12:00, 14:00–15:00; Su 10:30–12:00, 14:00–15:00; Th F closed (for non-Muslim visitors). Another mosque, that resembles Omar Ali Saifuddin Mosque. Whereas Omar Ali Saifuddin mosque is built to commemorate Sultan Omar, this mosque is to commemorate the current reigning Sultan. Visitors, including non-Muslims, can go inside after removing shoes and covering up with a black robe. 4.88049114.943683 Kampong Ayer (Water Village). The water village is a beautiful sight to see hundreds of houses seemingly floating on water. The village, which is the world's biggest settlement on stilts, has been on the river for over one thousand years and was the capital of the Bruneian Empire. The water village people are very friendly and many open up their homes to visitors year-round. For a tour by boat, water taxis can be found by walking along the Brunei river or the main market in Bandar Seri Begawan and waving one down. Try to negotiate the price down—you shouldn't pay more than B$30 for an hour-long tour (B$15 for half an hour) of Kampong Ayer. Even though the water taxis are not wheelchair-friendly, their drivers are very willing to lend a hand and even team up and carry a person in a wheelchair on board; ask for a larger boat though. But to really experience the water village, you've got to walk around and explore it. You can take a water taxi across for $1 per person (a 2-minute ride). Ask the driver to take you to the gallery (4.884202114.9446454 Kampong Ayer Cultural & Tourism Gallery), which has a detailed exhibition of the history of Kampong Ayer and some lovely artistic souvenirs for sale. The gallery is open 9AM–5PM, but closes Friday 11AM–2:30PM for Friday prayers. The observation tower next to the gallery has views of the water village and the city center. Then don't just stay at the edge of the village near the gallery – go into the village and walk around. Not many tourists seem to go in, so you may get curious hellos from residents, especially children. You'll see people going about their ordinary routines, which feels almost surreal since it's all suspended a few meters above the river. If you look around you might spot a mosque, schools, whimsically colorful buildings, and even chickens. The boardwalks might make you nervous, but there's no reason to worry – just watch your step. They're more stable than they look, and even if you did somehow lose your balance and fall in, it's just a short swim to the nearest ladder – in a way it's safer than walking next to a busy street. Don't wear high heels though. If you don't want to shell out for the ride, you can also walk into the village – start from behind the Sultan's Mosque or from the other bank in Batu Satu. Free entry. 4.892881114.9415625 Royal Regalia Museum (Bangunan Alat Kebesaran Diraja), Jalan Sultan Omar Ali Saifuddien (entrance on Jalan Sultan, next to the Brunei History Centre, between Jalan Stoney and Jalan James Pearce. ), ☎ +673 224 4545. Open daily 09:00–16:30 (but closed Friday 11:30–14:30 for Friday prayers). It displays the royal accessories utilised during the coronation, and some reproductions, as well as gifts received by the Sultan from dignitaries and civilians all around the world. Definitely worth checking out. If you don't have time to visit both, and need to choose between this museum or "Brunei Museum" at Kota Batu, choose this one. Photography isn't allowed; you have to leave bags, phones, and cameras in a locker when you come in. You have to take off shoes and the floors are marble, so wear socks. Has a gift shop with souvenirs. Free entrance. 4.871151114.9197966 Istana Nurul Iman. The residential palace of the Sultan. It is not possible to enter, yet the huge size of the palace attracts tourists to snap picture in front of the gate. The palace is however, hidden behind the landscapes, so a better picture can be seen in flyers or souvenirs that feature it. 4.885383114.9686627 Brunei Museum (on the Kota Batu road). 9AM-5PM. Has just closed for a undetermined period of time, maybe until 2016. Though had an excellent display in the Islamic Art Gallery. It is highly recommended. After visiting the Brunei Museum, walk along the road toward BSB to visit two tombs: the first is the Tomb of Sharif Ali, the third sultan of Brunei. The green sign by the road is written entirely in Arabic lettering. Further down the road is the Tomb of Sultan Bolkiah, the fifth sultan of Brunei. Both tombs are in easy walking distance from the Museum. 4.883352114.969818 Malay Technology Museum (Muzium Teknologi Melayu) (walk a short distance down from the Brunei Museum). This place has many exhibits featuring the different style of houses and lifestyle of those who live on the water village. Free. Small market town with population of 21,000, 24 km west of Bandar Seri Begawan. Small town on the north-eastern tip of Brunei where the country's only deep-water port is located. 5.038154115.07851212 Muara Beach (take Bus 39 to the Pekan Muara bus terminal and then transfer to a bus to Muara Beach). Beautiful beach with food stalls, playground and washrooms. Another small town with population around 10,000 people close to Muara. 4.989506115.068313 Serasa Beach. Beach got a major face lift in 2015 and now features stylish restaurants, showers, walking trails. Every year, for three days at the end of Ramadan, the sultan of Brunei, Hassanal Bolkiah, opens his palace (Istana Nurul Iman) to the public. This event is primarily intended for the citizens of Brunei to meet their sultan, but foreigners are welcome too. Prepare to queue up for hours; even the queue for security alone takes over an hour. In the palace, free meals are distributed amongst all visitors; there is a wide choice. You can then queue up again in order to meet the sultan himself. You won't have the opportunity to exchange more than a handshake and a few words with him, but it's still a unique opportunity to meet a head of state. Unfortunately, the sultan only meets men. Fortunately though, women can meet his wife, Queen Saleha, in similar arrangements on the same three days. Several currency exchange places can be found downtown. 4.905779114.9168522 The Mall (Across the river from the night market.). A good place to shop for supplies, or to check out some local department stores. Surprisingly few multi-national brands. Located in Gadong, it is combined with the Rizqun Hotel. It also has a good souvenir shop. 4.887842114.9401973 Yayasan. Built by the sultan to support the welfare of the people. Located in central Bandar. 4.900515114.9269451 Aminah Arif Restaurant. One of a few local restaurants that features the Bruneian delicacy ambuyat and a pretty good range of other food too. RMS Portview, opposite the Yayasan Shopping Centre. The terrace offers a great view overlooking Kampong Ayer, great for cooling down after sightseeing. Gerai Makan, on the waterfront in the southeastern corner of the city, just across a bridge. Here there are a number of outdoor restaurants serving cheap and tasty fare. It's a great place to relax and soak in the local atmosphere. Great views of stilt villages and water taxis speeding back and forth. PGS Cafe, near the Palm Garden at Kiulap. Charges buffet dining at B$6 per head in a pleasant air-conditioned restaurant. There are plenty of small local Kedai Kopi (coffee shops) in town that sell simple, cheap and tasty food and are frequented by locals. Tagz Lounge, Sheraton Utama Hotel. The closest you can get to a bar in an alcohol-free country, here you can bring your own booze and buy the mixers. Access theoretically only for hotel guests, but getting in is rarely a problem. Most hotels in Brunei are in the middle to higher price range. 4.892136114.9439771 Pusat Belia Youth Hostel, Jalan Sungai Kianggeh, ☎ +673 887 3066 (Manager), +673 899 8852 (Assistant Manager). Check-in: after 7:30PM, check-out: 11AM. Closed until mid March 2016. Designed more for school groups than for backpackers. Dorm beds are B$10/night, making it the cheapest sleep in town. Male and female sleeping quarters are separated, so this can be an inconvenience for couples. The location, however, is quite convenient as it is close to downtown BSB. The rooms are spacious and clean, as the commodities. The free Wi-Fi is not always available. It is best to arrange a bed in advance, since the manager is not always present. He generally arrives at 7:30PM but is reachable by phone during the day. The e-mail addresses indicated online are wrong. There's also a swimming pool nearby ($1, 8AM-6PM). $10/bed. 4.875227114.9545982 APEK Utama Hotel, Simpang 229, Kampung Pintu Malim (on the Kota Batu road towards the Brunei Museum, take the bus 39 from downtown), ☎ +673085154564, e-mail: info@apekhotel.com. Another budget option. Cozy and a great deal. The only disadvantage is that it's 2 km from downtown BSB, but Bus 39 (B$1) or water taxis (B$1–2) can solve this problem. B$30-60. 4.88901114.943433 KH Soon Resthouse, 140 Jalan Pemancha (very near bus station), ☎ +673 222-2052. Although it is probably the worst deal in South East Asia, its major advantage is its excellent location, right downtown near the bus terminal, with an ATM on the corner and an Internet café in the adjacent alley. The staff are friendly and helpful, though the rooms are really spartan. 24-hour reception. No Wi-Fi, no shared computer, no non-smoking area, no Western-style toilets, no booking service, no fan. Also note that everyone in the building opposite the road will see you when you take your shower. In the same building you will find a very useful information center, Borneo Guide. Single/double shared bathroom B$35/40, attached bathroom $40-50. 4.888915114.9440334 Brunei Hotel, 95 Jalan Pemancha (near the downtown bus station), ☎ +673 2244 828, e-mail: reservations@thebruneihotel.com. On Jalan Pemancha, a 15-minute drive from the international airport. Rooms are air-conditioned and equipped with satellite TV, a mini-bar, IDD telephone, and Internet access. B$130-155. 4.92066114.8384855 Jeruton Hotel, Simpang 396, Sengkurong, ☎ +673 261 2233, e-mail: frontdesk@jerutonhotel.com. Convenient only for the Jerudong area but excellent value withs rooms with a/c and restaurant. Car or taxi essential. Standard B$40, super $50, suites $60-100. 4.89996114.9020446 Traders Inn, Jalan Gadong. Coffee Lounge offers various Asian and western cuisine as well as coffee and treats. Free Wi-Fi is available in every room. Make sure to book at appointment at the Foot Reflexology Center after a long day of sightseeing. $80-120. LeGallery Hotel, ☎ +673 222 1228. In the Seri Complex - B$58/night. A boutique hotel located in the heart of the Seri Complex. Offers friendly and artistic ambience with reasonable rates. The Holiday Lodge Hotel, Lot: 27192, Kg Jerudong, Jalan Pulau Kubu P.O.Box 555, Sengkurong Negara Brunei Darussalam, ☎ +673 2611618. The Holiday Lodge Hotel, in restful tones of terra cotta and cream with deep green trim, features a two-storey foyer where guests are greeted with traditional hospitality. Well-known for warm and friendly service, located near Jerudong Park, on the coastline of the South China Sea, and roughly equidistant from Brunei International Airport and Bandar Seri Begawan, Brunei Darussalam's Capital, The Holiday Lodge Hotel offers a relaxing environment and proximity to the country's attraction: Jerudong Park Playground. Jerudong Park Playground is a mere 5 minutes' walk or a complimentary shuttle from The Holiday Lodge Hotel. Orchid Garden Hotel, Lot 31954, Simpang 9, Kg. Anggerek Desa, Jalan Berakas BB3713, ☎ +673 2 335544. Four-star hotel. The Empire Hotel and Country Club. Family, beach and spa resort that overlooks the South China Sea. A 5-star property. Rooms from US$150. Radisson Hotel Brunei Darussalam, Jalan Tasek Bandar Seri Begawan BS8211 Brunei, ☎ +673 2244272, fax: +673 2221579. Check-in: 3PM, check-out: noon. Walking distance to several tourist attractions in the city Rates start at $162. Grand City Hotel, Tel: 2452188. A useful hotel near the airport. Will arrange transport even for a short rest of a few hours. Crime is very uncommon in this tightly controlled small country. 4.888746114.9421622 Australia, Level 6, DAR Takaful IBB Utama, Jalan Pemancha. M–F 8AM–5PM; appointment required (book online). Canada, 5F, Jalan McArthur Bldg No. 1, Jalan McArthur, ☎ +673 222 0043, fax: +673 222 0040, e-mail: bsbgn@international.gc.ca. M-Th 8:30AM-noon and 1PM-5:30PM, F 8:30AM-2PM. China, NO.1,3,5 Simpang 462, Campong Sungai Hanching, Jalan Muara, ☎ +673 2 334163, fax: +673 2 335710, e-mail: embproc@brunet.bn. Indonesia, Simpang 336-43, Jalan Kebangsaan, Kampung Kawasan Diplomatik, Mukim Kianggeh, Brunei Muara, ☎ +673 2330180, fax: +673 2330646, e-mail: bsbegawan.kbri@kemlu.go.id. 4.899273114.9268663 Japan, 33, Simpang 122, Kampong Kiulap, ☎ +673 222-9265, fax: +673 222-9481, e-mail: embassy@japan.com.bn. M–F 8:30AM–noon, 1PM–5PM. Malaysia, No. 61, Simpang 336, Jalan Duta, ☎ +673 2381095, +673 2381096, +673 2381097, fax: +673 2381278, e-mail: mwbrunei@kln.gov.my. M–Th 8AM–12:15PM, 1:30PM–4:30PM F 8AM–noon, 2:15PM–4:30PM. United States, Simpang 336-52-16-9, Jalan Kebangsaan, ☎ +673 238-4616, fax: +673 238-4606, e-mail: amembassy_bsb@state.gov. M-F 7:45AM-4:30PM. Church of Our Lady of the Assumption, 11 Jalan Kumbang Pasang. 4.895255114.9396754 St. Andrew's Anglican Church, Jalan Kumbang Pasang. Sunday services in English (liturgical at 7:45AM and contemporary at 10AM), Chinese (3PM), Iban (6PM), and Tamil (8PM). This city travel guide to Bandar Seri Begawan is a usable article. It has information on how to get there and on restaurants and hotels. An adventurous person could use this article, but please feel free to improve it by editing the page.